Happy Thursday, friends!! Sorry for my absence in posts this week...I've been a little busy! I hope that you've been having a good week so far! Josh is traveling this week, so it is just me & the puppies until tomorrow evening. Today is the Glitz Design May blog hop, and this month we are focusing on our fabulous 8x8 & 6x6 paper pads. Did you know that the smaller paper pads have quite a few paper designs that are not available in the 12x12 format? They are great for layering on your layouts, and PERFECT for making cards. Here is the card I made using the Uncharted Waters 6x6 paper pad, & other items from the collection! 1. Make 5-inch card from white cardstock. 2. Cut background paper slightly smaller, then wrap crepe paper trim around the middle. 3. Adhere the scalloped paper strip to the middle of the crepe paper, then add a circle paper strip to the bottom of it. 4. Add the journal card & diecut frame to the top of the card. 5. Tie twine around the middle in a double bow, then accent with a rhinestone. 6. Adhere the entire paper block to the front of the white card base. 7. Add the cardstock sticker to the top of the journal card using foam adhesive, then accent with a gold photo corner & tab. 8. Add the wood veneer hearts to the front, then accent each side of the journal card with washi tape bits. 9. Add sequins & pearls to the card to finish. Of course, a blog hop isn't a hop without a list of participants...so here you go!! Leave a comment on each design team member's Glitz Design blog hop post & on the Glitz Design blog to increase your chances of winning the fabulous Glitz prize this month! 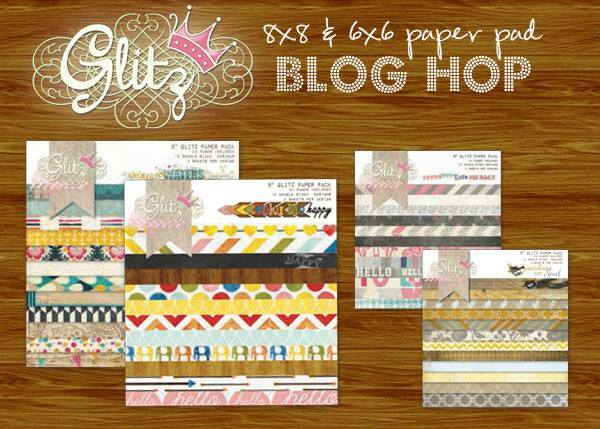 One lucky winner will receive an awesome 8x8 & 6x6 Glitz Design paper pad goodie package!! It's such a gorgeous, bright and fun card! The wood hearts are a perfect finishing touch! so so many elements here to look at. A wonderful card. Pretty card. The instructions are great. I feel like even I could make it if I followed them :). Fabulous!! Glitz is awesome, isn't it? I absolutely LOVE this! So many layers of colorful goodness! Just fabulous! What a wonderful card you have there! Loving it! Thanks for sharing, well done. Fantastic layering. I love the wood veneers and that little bit of gold glitter peeking out. Such a fun card! I love how you can pile it on and make it all work together so nicely - I could sit and stare at this card all day! What a gorgeous card, I love all of the layering! Wow, amazing card! Love the layers and textures! Lots of great color and details on your card! Fabulous card!!! Love using paper pads for my projects. Fun blog hop! Oh my gosh I love this card ! The crepe ribbon, the wood embellishments and the twine. Gorgeous ! Sooooo pretty, Lea! I love this! Very sweet card with these colors and layers. Am loving this card Lea...thanks for sharing. thank you so much! as always, I love your card! wouahhhh !!! elle est trop trop belle!! Awesome card! Love how the colors really pop! awesome card. Love the mix of the color and the pattern on your card. Your new blog background is beautiful! wonderful layers on the card. Thank you for the inspiration. HOLY MOLY - this is a SUPER fun card! LOVE the latest look of your blog, my dear! Sooooo fun! This is such a wonderful card! So many elements to look at! I'm loving the colors! I didn't come here for this hop, but how can I not comment on this card! Holy Cow Bells is this beautiful! I love all the layers and details! What a fab card! So much to look at and lots of gorgeous little details!